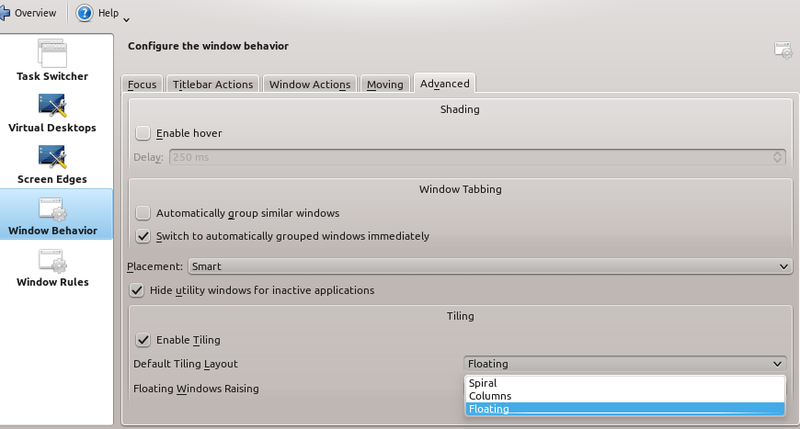 There are 3 tiling modes in KDE: spiral, columns and floating. What does each do and how do make them work for me? For example, spiral seems to cut my screen in half then the next half another way. Is it possible to adjust it so that it's like 2/3? I don't understand how to make use of float. Perhaps someone could explain what each is for (or one for each answer) and how they can be used and tuned. Floating means 'untiled', spiral places windows in a spiral form and column tiles them vertically. PS: answer mostly taken from Kent's comment. Not the answer you're looking for? Browse other questions tagged kde window-manager kwin tiling-wm or ask your own question.